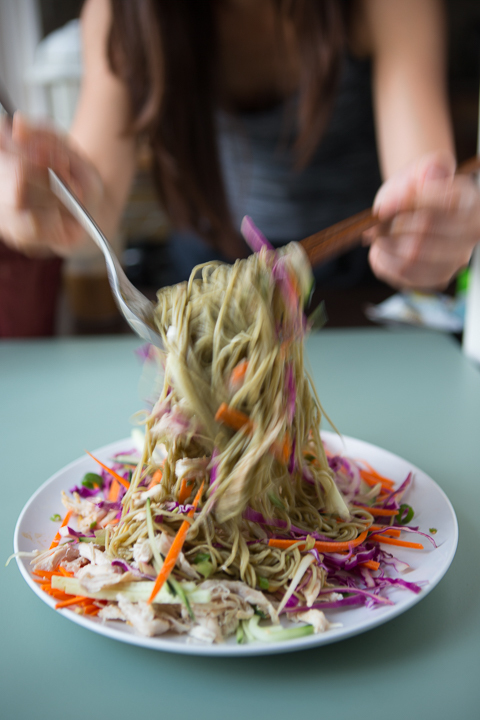 Here's my Americanized take on Taiwanese sesame cold noodles. 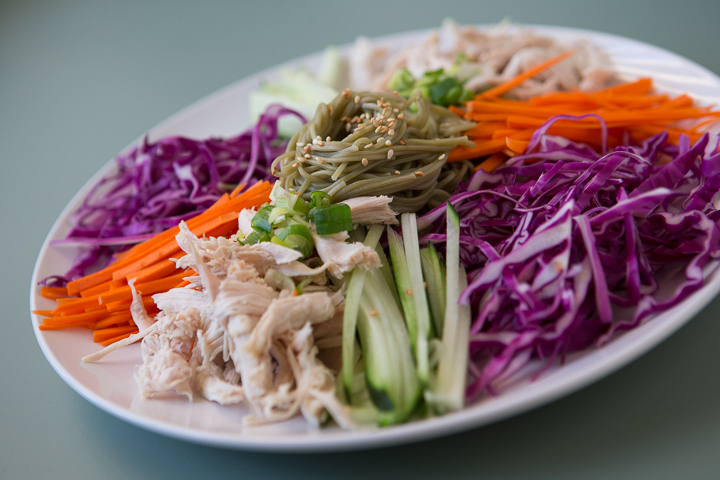 It was one of my mom's favorite things to eat, sometimes I see it at Taiwanese restaurants with ham and egg, or at the Chinese supermarket with shredded chicken. There's always cucumber and carrot, never purple cabbage. Egg noodles are customarily used. I've bastardized it with my soba (green tea soba, in this case) and, well, purple cabbage and other untraditional toppings. 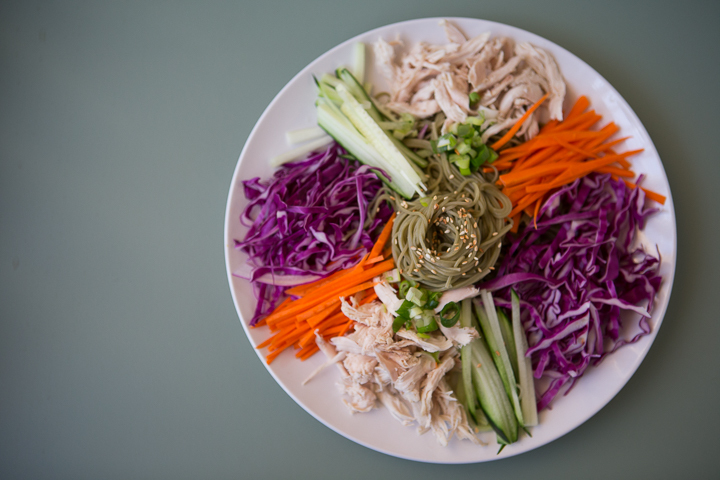 You won't see avocado, raw daikon radish root, or seared ahi tuna on sesame noodles anywhere else but in our kitchen. The thing that I wanted to share though, is my sauce. 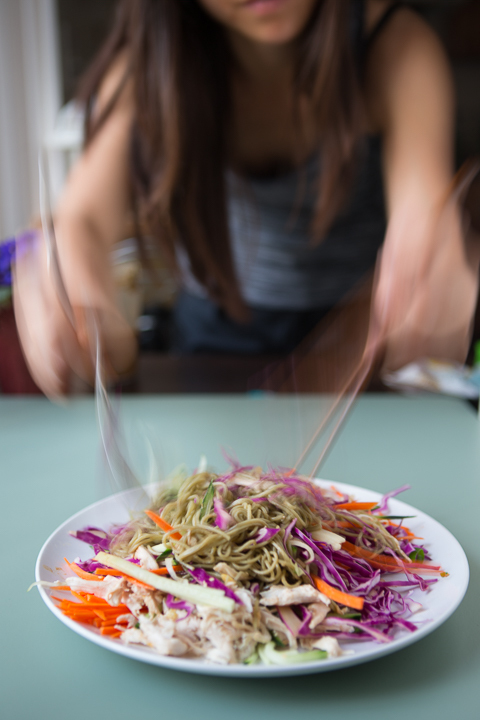 My version is zingy-er than your average sesame noodle sauce, which often cakes onto the noodles in a very thick coat. This one is more of a vinegar-based recipe, which my grandmother would probably frown upon. I also use honey, which I am sure would also make Taiwanese people roll their eyes. Hey, maybe the loads of minced ginger and green onion that go into it will redeem me. 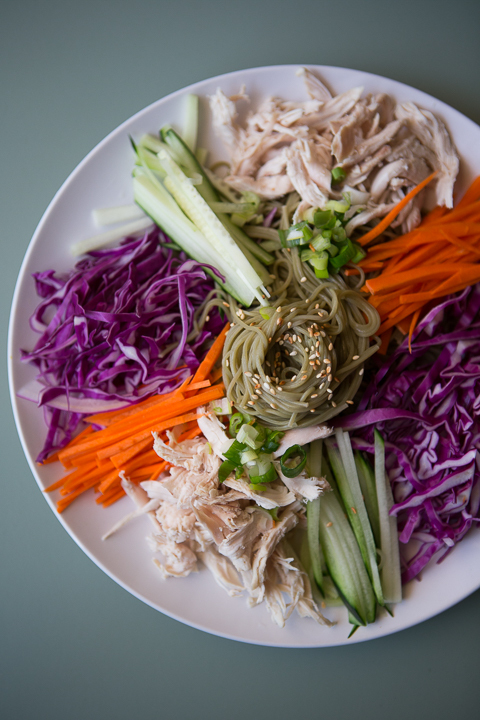 I don't make cold noodles too often, since it takes a lot of time to julienne everything (anyone else afraid to use a mandoline? 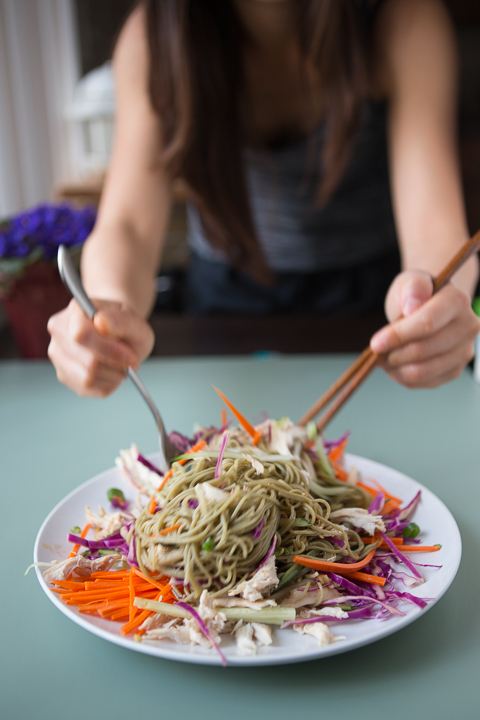 ), but it's a no-brainer recipe, especially if there is leftover rotisserie chicken in the fridge and a pack of dry green tea soba noodles on hand. It's also super refreshing to eat on extreme heatwave days. Every time I make this dish, it tastes a little different because I don't have a specific sauce recipe, but I figure I should try to write one down. I am purposefully using a high ratio of vinegar, so that it tastes more like a noodle salad than purely a noodle dish. If you like it less "zingy" and more rich, then you'll have to cut the vinegar in half and put more sesame paste. 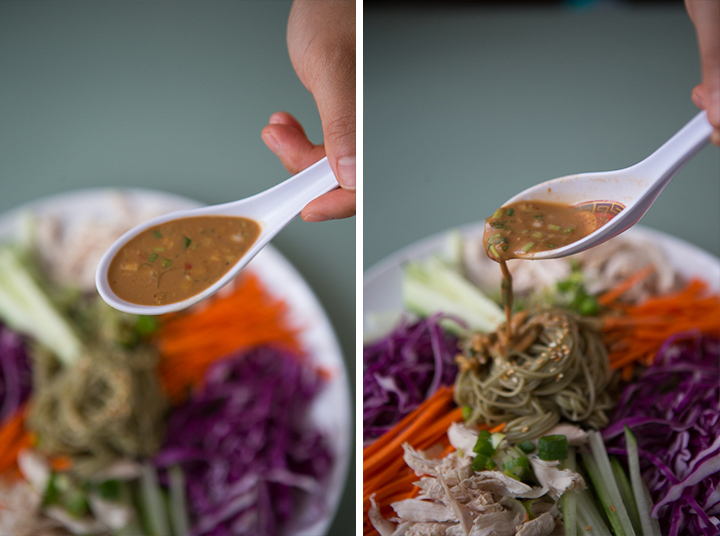 I've come to realize that I favor using Middle Eastern tahini for this recipe, because it pours smoother and combines more easily than traditional Taiwanese sesame paste. 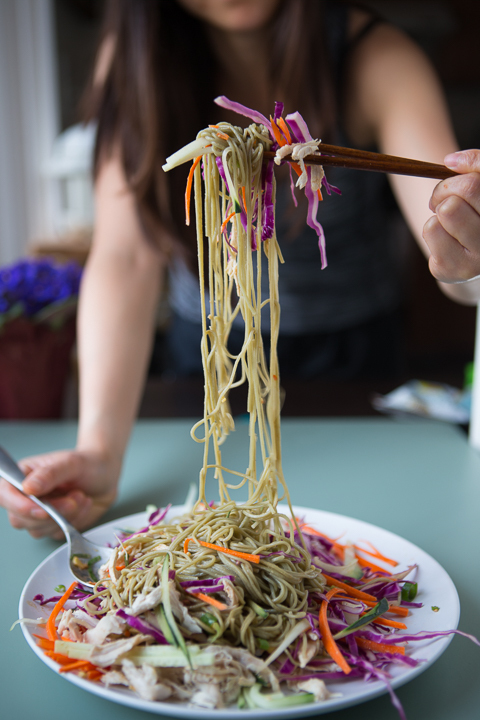 Which noodles, vegetables, and protein to use are totally up to you. I like soba, or recently I just tried with some yam noodles that were made in Taiwan. Egg noodles are always good too, but too boring in my opinion. Just be prepared to slice, slice, and slice. And mince. It's worth it in the end, believe me! Plus, part of me enjoys mindlessly julienning vegetables in my air-conditioned kitchen on a hot day. Mix it all up - be sure that the sesame paste / peanut butter and honey are well integrated. That's it! No rotisserie chicken leftovers? In the past, boiling a chicken breast and shredding it by hand or making a thin egg pancake in a frying pan and slivering that up have both worked well. Or it can be good without meat too. Just for the sake of memories, the backstory behind this meal was that on the night before I made this, Wes was just in San Francisco on short notice for work, and unexpectedly had to spend a night there...with no toothbrush and no change of clothes. I ended up having a nice night in, whipping up kabocha soup and stir-frying the two lone bunches of limp gai choy in our vegetable drawer while reading Time Magazine. He bought himself a personal pizza, walked it back to his hotel, and ate it in bed while watching the NBA finals. Aside from the fact that I had to singlehandedly hack at that kabocha squash and the fact that he had nobody's leftover crusts to munch on, we were quite happy on our own. When he finally landed in Burbank, he was super exhausted but I made him take pictures of my noodles anyway. Selfish and horrible! He was probably thinking that he should have stayed in San Francisco another day to eat more pizza. Anyway, you'd be stopping to shoot your food too once you make these - they're extremely photogenic, especially with that squiggly purple cabbage and all of those gorgeous matchstick veggies!